Summary: Thought-provoking and definitely worth a look-in. Apart from its’ illustrious vehicular past and the naked lady on a horse, Clive Owen seems to be one of Coventry’s few fine exports. 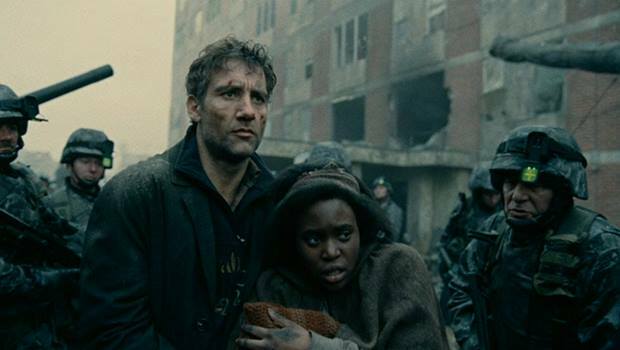 Children of Men wallops you right between the eyes, much of it thanks to his utterly charismatic presence. A dystopian world like no other, Children of Men shows a state of flux in 2027 where women no longer have the ability to reproduce, and haven’t done for 18 years. As a result of this pandemic the world has pretty much gone to the dogs, anarchy and chaos rein – with the sole exception of blighty… for a little while at least. Graffiti slogans such as “The last one to die please turn out the light” pretty much sum up the attitude most people seem to be hurtling toward. We’re in a state of shock and disorder. With immigrants and ‘fugees’ kept in cages after being caught by the authorities, and several militant urban uprisings against an authoritarian government. Fertility testing is compulsory, anti-depressants are given out as part of rations, and suicide pills are openly and legally sold. The death of the youngest person on earth kind of tips everybody over the edge – making things all too real for former activist turned civil servant Theo Faran (Owen). Especially when he’s kidnapped by The Fishes, a guerrilla group demanding the end of the government’s anti-immigration policy. It’s headed by his ex-wife Julian (Moore), who makes him an offer he can’t quite refuse… No, not that – Cash for transit papers. But as he takes up the offer, things aren’t quite as they seem. Adapted by Cuarón from P.D. James’s novel of the same name, it has been changed considerably for the screen, but is a succinct piece of work. It shows a cold grey Britain in a real state of flux. Whilst initially we see some semblance of normalcy with people trying to get on with life, the death of Baby Diego almost acts as a catalyst for some quite disturbing events (and visuals) as implications of the inevitable near future become all too clear. As Owen gamboles through the country with Ashitey, Surrey bears more resemblance to Beirut… But this is a well organised mess, if at times brutal. Its subtle touches are what make it worth a watch; exploring political, ethical and idealist viewpoints albeit in a short span. His character left his revolutionary disposition a while back, but is inextricably dragged back into a struggle of sorts – in danger from both the government and the so-called ‘freedom fighters’. Owen is fantastic as per usual; his disillusioned alcoholic has its own subtle dignity as he takes on the role of protector to Kia (Ashitey), as comes his own awakening. Caine is brilliant, Ejiofor does much with little, and Moore isn’t unfortunately given much scope to emote. Ashitey has the right personality for the only light in the ensuing darkness. In my eyes, Bexhill really will never look the same; the movie’s immigration internment camp really is the thing of nightmares. This is incredibly moving, the movie a parable of sorts; the closing images a metaphor that slaps you in the face – so blatant with its’ message on life being so precious / the futility of war. We still never quite get to grips as to what caused the fertility problem, but Cuarón keeps the pace of the script steady and intelligent enough for us not to question it – just enjoy the ride. Thought-provoking and definitely worth a look-in.